Home/Animals and Sound/Use of Sound/How do marine animals use sound? Many marine animals rely on sound for survival and depend on unique adaptations that enable them to communicate, protect themselves, locate food, navigate underwater, and/or understand their environment. They may both produce sounds and listen to the sounds around them. Sounds are particularly useful for communication because they can be used to convey a great deal of information quickly and over long distances. Changes in rate, pitch, and/or structure of sounds communicate different messages. In particular, fishes and marine mammals use sound for communications associated with reproduction and territoriality. Some marine mammals also use sound for the maintenance of group structure. 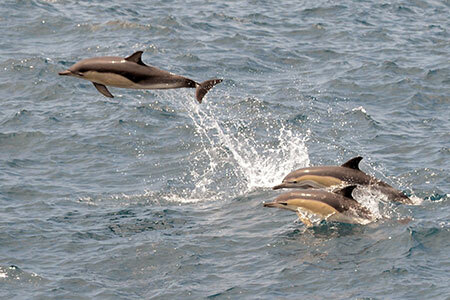 Dolphins, such as these common dolphins (Delphinus spp. ), travel in large groups, therefore, sound is important for communication to maintain group structure. Photo courtesy of NOAA/NEFSC. Similar to sonar systems on ships, some whales use sound to detect, localize, and characterize objects. By emitting clicks, or short pulses of sound, these marine mammals can listen for echoes and detect objects underwater. This is called echolocation. Some whales and dolphins use echolocation to locate food. They send out pulsed sounds that are reflected back when they strike a target. The analysis of the echoes helps the animals determine the size and shape of an object, its location, whether it is moving, and how far away it is. Echolocation is an effective way to locate prey and also helps whales and dolphins analyze their environment. 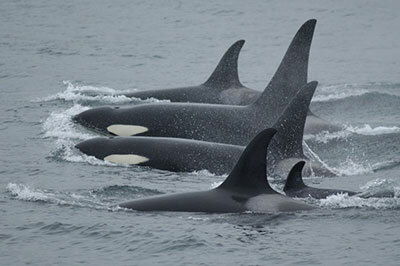 Toothed whales, such as these orcas, use sound to locate prey. Photo courtesy of NOAA/NMFS. Many species of fish and aquatic invertebrates also use sound. Fishes produce various sounds, including grunts, croaks, clicks, and snaps, that are used to attract mates as well as ward off predators. 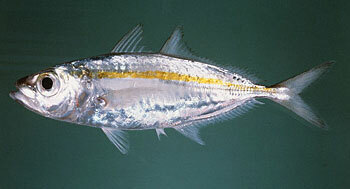 Big eye scad, a tropical fish, produce sounds using their pharyngeal teeth. These sounds are often heard when a fish is captured and may function to ward off predators. Photo courtesy of John E. Randall. The life history of many coral reef fishes includes a pelagic larval stage that metamorphoses to the juvenile stage. Late stage larvae and transforming juveniles need to reach suitable reef habitats to mature. There is some evidence that underwater reef sounds may be detected by coral reef fish (and invertebrate) larvae guiding them to coastal areas and allowing them to identify suitable settlement habitatsSimpson, S., Meekan, M., McCauley, R. and Jeffs, A. (2004) Attraction of Settlement-Stage Coral Reef Fishes to Reef Noise. Marine Ecology Progress Series, 276, 263–268. https://doi.org/10.3354/meps276263. Mann, D., Casper, B., Boyle, K. and Tricas, T. (2007) On the Attraction of Larval Fishes to Reef Sounds. Marine Ecology Progress Series, 338, 307–310. https://doi.org/10.3354/meps338307. Vermeij, M.J.A., Marhaver, K.L., Huijbers, C.M., Nagelkerken, I. and Simpson, S.D. (2010) Coral Larvae Move toward Reef Sounds. Vollmer, S., Ed., PLoS ONE, 5, e10660. https://doi.org/10.1371/journal.pone.0010660. Simpson, S.D., Meekan, M.G., Larsen, N.J., McCauley, R.D. and Jeffs, A. (2010) Behavioral Plasticity in Larval Reef Fish: Orientation Is Influenced by Recent Acoustic Experiences. Behavioral Ecology, 21, 1098–1105. https://doi.org/10.1093/beheco/arq117. Kennedy, E.V., Holderied, M.W., Mair, J.M., Guzman, H.M. and Simpson, S.D. (2010) Spatial Patterns in Reef-Generated Noise Relate to Habitats and Communities: Evidence from a Panamanian Case Study. Journal of Experimental Marine Biology and Ecology, 395, 85–92. https://doi.org/10.1016/j.jembe.2010.08.017.. Different coastal habitat types have been found to produce different ambient sounds over short distances. 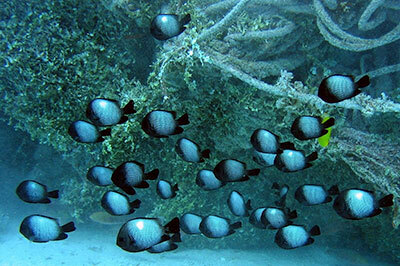 The larvae of some coral reef fish species like these damselfish, may use sound to locate suitable settlement areas. Image credit: NOAA. Little research has been done on marine invertebrates that produce sounds. However, several marine invertebrates, including spiny lobsters and fiddler crabs, have been found to produce sounds for defensive and courtship purposes. Some marine invertebrates use sound for other purposes. The cleaner shrimp announces itself as a cleaner and advertises its services by clapping one pair of its claws when reef fish approach. 1. ↑ Simpson, S., Meekan, M., McCauley, R. and Jeffs, A. (2004) Attraction of Settlement-Stage Coral Reef Fishes to Reef Noise. Marine Ecology Progress Series, 276, 263–268. https://doi.org/10.3354/meps276263. 2. ↑ Mann, D., Casper, B., Boyle, K. and Tricas, T. (2007) On the Attraction of Larval Fishes to Reef Sounds. Marine Ecology Progress Series, 338, 307–310. https://doi.org/10.3354/meps338307. 3. ↑ Vermeij, M.J.A., Marhaver, K.L., Huijbers, C.M., Nagelkerken, I. and Simpson, S.D. (2010) Coral Larvae Move toward Reef Sounds. Vollmer, S., Ed., PLoS ONE, 5, e10660. https://doi.org/10.1371/journal.pone.0010660. 4. ↑ Simpson, S.D., Meekan, M.G., Larsen, N.J., McCauley, R.D. and Jeffs, A. (2010) Behavioral Plasticity in Larval Reef Fish: Orientation Is Influenced by Recent Acoustic Experiences. Behavioral Ecology, 21, 1098–1105. https://doi.org/10.1093/beheco/arq117. 5. ↑ Kennedy, E.V., Holderied, M.W., Mair, J.M., Guzman, H.M. and Simpson, S.D. (2010) Spatial Patterns in Reef-Generated Noise Relate to Habitats and Communities: Evidence from a Panamanian Case Study. Journal of Experimental Marine Biology and Ecology, 395, 85–92. https://doi.org/10.1016/j.jembe.2010.08.017.